The flehman grimace is a rather comical sight when you lucky enough to see it. The organ involved in the grimace in the flehman response in mammals is the vomeronasal organ otherwise known as the Jacobson’s organ. It was discovered by Frederik Ruysch and later described by Ludwig Jacobson in the early 1800’s. The primary role of the Jacobson’s organ is for insight of certain scents and pheromones in corresponding mammals by sending chemical messengers that carry information between individuals of the same species. The word flehman comes from the German word flehman which means to bare the upper teeth. Which if you have ever seen a flehman occurance is a rather fitting name! But why do mammals do this? The Jacobson’s organ is used to check hormone condition and identify gender of animals. It often looks like the animal is snarling or baring their teeth at you. The animal inhales the scent and then closes the nostrils to allow the scent into the Jacobson’s organ. The most common time to see the flehman grimace is when a dominant male animal is testing a female’s scent for fertility. This is most commonly done during or shortly after the female urinates. 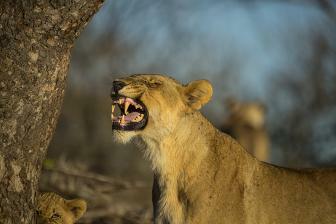 This morning, during a Leopard Mountain game drive, I was following a pride of lions and in all my years of being a game ranger it was the first time I have ever seen a female do the flehman grimace. What really melted my heart was when her young cub joined her to sniff and then also proceeded to do a younger version of the flehman grimace. I am assuming the big male lions had come passed that tree recently and used it to mark their territory. Every day spent living in the bush is nothing short of incredible – you truly never stop learning and having new exciting experiences!